"The soul that pines for eternity shall outspan death. You, dweller of the twilightvoid, come Dunwich." Zombie films seem to have gone out of fashion. I remember in the early 80's when zombie films seemed to be the be-all-and-end-all of horror entertainment. As a kid, these gory spookers were "forbidden" from my young eyes, so that watching one was almost a rite of passage. Now, filmmakers seem to have forgotten our undead friends, or use flashy effects to resurrect them. Director Lucio Fulci's City of the Living Dead is a wonderful window back into that era of monster films, when no cared about the cast, budget, or effects. Instead, people just wanted to be creeped and grossed out in dark theatres. Though Lucio Fulci's Zombie was the film that brought him name recognition in America, City is usually considered one of his better works. Released in the U.S. in 1981 as The Gates of Hell, the film was heavily edited—as with many Italian horror films. Fulci gained a reputation as an ultra-gory filmmaker, as seen in the extreme violence of his works. Unfortunately, many people dismissed these films as mere sloppy B-movies created solely for the exploitation of violence. City of the Living Dead opens with a priest hanging himself in a town called Dunwich. A group of women (psychics) holding a seance see this suicide in a mystical vision. The vision is so terrifying one of the women actually dies. These psychics claim that the gates of Hell have been opened and, where the priest died, the dead will rise, but no one will listen. So, meanwhile in Dunwich, the horror of Hell comes to pass in bizarre occurrences. Eventually, one of the psychics (Catriona MacColl) teams up with a nosey journalist (Christopher George), and they travel to Dunwich in attempt to close the gates of Hell. The plot is a little confusing, but none of it really matters once the movie kicks into high gear. 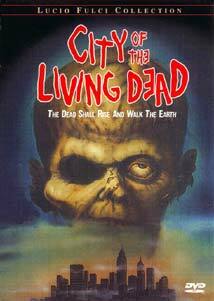 Unlike the many undead films most audiences are used to, City has a surreal quality to it. Instead of being slow-paced lurkers, the undead are more dreamlike and mysterious. They can teleport at will, and the zombie "leader" (the dead priest) can kill at a glance. As the psychic races to close the gate before All Saints Eve, Dunwich becomes a town where no place is safe and no one is spared the horror. While the film is infamous for its level of gore, I actually found the film rather mild compared to many others in the genre. For those who have weak stomachs, City of the Living Dead might be a little hard to take, but if you've sat through classics like Dawn of the Dead, Day of the Dead, or Zombie, nothing should shock you. The film's most talked-about scene is an impressive "head-drilling" sequence containing excellent effects. In fact, there are good gore effects that blend seamlessly into their scenes, and are disturbingly memorable. Rest assured these will stick with you after viewing! Because of the level of surrealism, City is an original horror film. While combining a lack of character development and a vague plot, the well-casted, multi-dimensional acting and general style of the film is so effective, few viewers will care. Lucio Fulci certainly builds up enough supernatural atmosphere to make things genuinely frightening. Be sure to look for Italian director/writer Michele Soavi as the first victim of a brain-squish! The element of terror is enhanced by the film's moody soundtrack. City of the Living Dead is the perfect flick to watch on Halloween with a group of friends and it certainly ranks amongst the best zombie films. Image Transfer Review: The new widescreen transfer Anchor Bay has served up is of very good quality. Age however, has obviously taken its toll on the print. There is a lot of grain and noise in many scenes. While colors and grays are well balanced, compression problems pop up in a few places. None of these issues have much dramatic effect on the movie, but they are present. Even with these flaws, the picture quality is still far superior to previous releases. Like many of these edited Italian horror films, most people wanted the uncut version that came from questionable print sources. Now, everyone can enjoy great picture quality AND the uncut version without having to watch some weird, illegal bootleg. The grade is based on the image quality possible, not "best possible." Audio Transfer Review: Anchor Bay's new 5.1 mix is more impressive than it might seem. While most of the film confines itself to the center channel, sound effects like zombie moans and victim's screams are flooded into the other channels to add flair. Surrounds are extensively used for wind and other eerie effects. Often times, zombies will appear on screen with a strange sound effect and a pound of effective bass. There isn't any precise imaging as you might find in a modern 5.1 film soundtrack, but it doesn't matter. The 2.0 soundtrack isn't quite as good. While it is certainly effective, it can't replace the loudness and intensity of the 5.1 mix. Having watched a few scenes with both tracks, the 5.1 easily wins in terms of atmosphere. Even if you don't have a full 5.1 setup, the track seems to have better frequency response and crisper dialog. Even though these older films are usually judged on picture quality, this new audio remastering easily makes up for any problems you might have with the rough print. Still photo gallery w/U.S. radio spots. Extras Review: The disc's primary feature is the photo gallery which is accompanied by the U.S. radio commericals for the film (advertised as The Gates of Hell). Of course, these radio spots are pretty funny in the exploitative way that old commerical way. The keepcase insert also has a reproduction of the original Italian poster (something I've missed in a few newer Anchor Bay releases). Unfortunately, other than a short bio on the late Lucio Fulci, there's no production info or cast/crew info. I couldn't help but think that a few more features could have been included; perhaps an old interview with Fulci or advertising materials from Italy. However, my disappointment is minor when considering the quality of the disc's presentation. Continuing to honor films that many mainstream companies ignore, Anchor Bay's work on the "Lucio Fulci Collection" is long overdue. There is an art and craft behind these Italian chillers that a whole new generation can now learn to appreciate. While many of us grew up on poor clones of these films, there are some horror films that just can't (or shouldn't) die. City of the Living Dead is every bit as good as the "big names" of the living dead movies, if not better. Unfortunately, Fulci's films are often wrongly compared to work by George Romero. Some critics go as far as to claim Fulci was copying Romero, or riding on the coattails of his success. Regardless, if you're in the mood for some good scares and creative filmmaking, you can't go wrong with City of the Living Dead. Recommended.